manufacture and installation capabilities are showcased in the 2m high structural glass wall that surrounds the track, as well as a staircase and balustrades within the spectator areas. multi-function rooms as well as a café. The cycling arena, only the fifth of its kind in the UK, will also double up as a concert venue with a capacity of 5,000. Arkoni's Managing Director, Mark Prentice explained, "We have worked with contractors Bowmer & Kirkland on a number of occasions, with this particular project being one of our biggest to date being valued at almost half a million pounds." The glass wall around the track is constructed from 39.5mm clear, low iron-toughened laminated glass panels, which are set into a fabricated channel fitted around the full oval of the cycle track with a stainless steel fascia cladding on the infield side. The design brief was that it has to withstand the accidental impact of the “derny”, the motorised pace cycle. There are also full height, glass double gates fitted with bespoke locking systems to allow access to the track from the inner area where cyclists assemble. As part of the design process, Arkoni undertook simulated glass impact trials in a specially designed test rig to confirm that the system was fit for purpose. The main public staircase took 3-4 months for full design, architects approval and manufacture within Arkoni's Brighouse-based workshops, and was installed on site in spring 2014. The staircase was constructed from 400 x 200 structural hollow section stringers, folded steel plate treads with closed risers and screeded tread infill and landing support from a tubular steel ‘V’ support. The staircase and first floor balustrade made from 1100mm high full height clear glass panels with handrails mounted from the glass panels. The staircase and landing steelwork was covered with polished stainless steel pressings bonded to steelwork with structural adhesive. 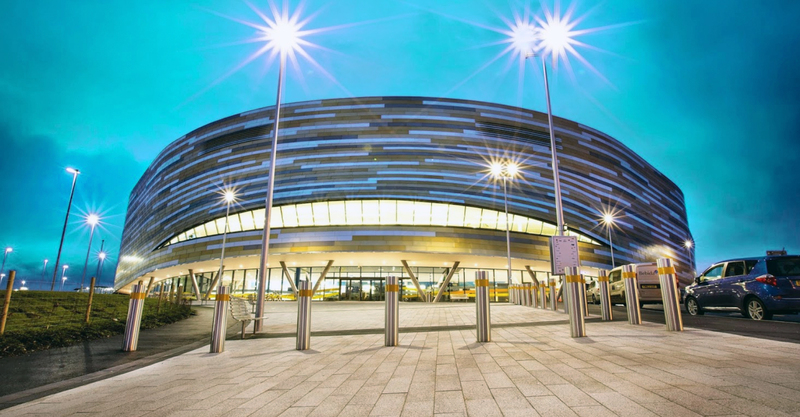 Arkoni also supplied and fitted glass screen balustrades to the viewing areas, stainless steel tubular balustrades with glass infill to both full height staircases and various handrails and protection rails around the velodrome.